REUTERS/Sergei KarpukhinBusinessman Gennady Timchenko attends a session of the St. Petersburg International Economic Forum 2014 (SPIEF 2014) in St. Petersburg May 24, 2014..
U.S. prosecutors have launched a money-laundering investigation into a member of Russian President Vladimir Putin’s inner circle, the Wall Street Journal reported on Wednesday, citing people familiar with the matter. According to the report, the U.S. Attorney’s Office for the Eastern District of New York is probing whether billionaire Russian gas trader and Putin associate Gennady Timchenko transferred funds related to allegedly corrupt deals in Russia through the U.S. financial system. The Justice Department is aiding the investigation, it said. The prosecutors are investigating transactions in which Gunvor Group, a commodities firm founded by Timchenko, bought oil from Russia’s OAO Rosneft and sold it to third parties, the newspaper reported. The report said that the transactions predate U.S. sanctions against Russia introduced in March on Timchenko and others over the Ukraine crisis. 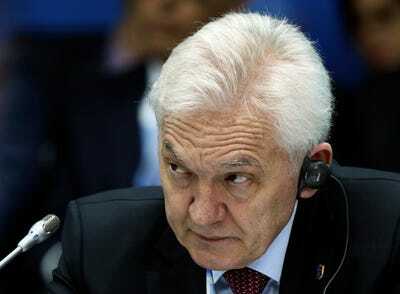 Timchenko is also co-owner of Russia’s No. 2 gas producer Novatek. Transfers of funds related to the transactions could constitute illegal money laundering if the funds were found to have originated from illicit activity such as, for example, irregular sales of state assets like oil, the newspaper said. The newspaper cited one source as saying the probe is also examining whether any of Putin’s personal wealth is connected to allegedly illicit funds. The U.S. Treasury has said that Putin has investments in Gunvor and may have access to Gunvor’s funds. Both the company and the Kremlin have strenuously denied those allegations. Timchenko, Gunvor, the U.S. Attorney Office and the Justice Department could not be reached out for comment outside the regular U.S. working hours.